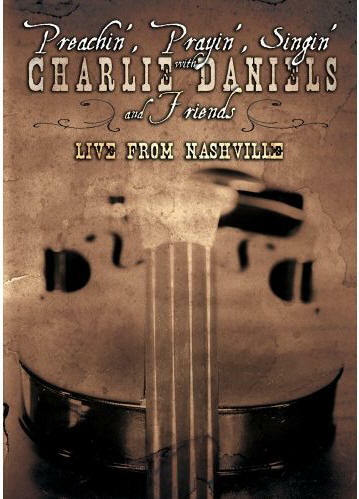 On April 25th, 2005 from the Ford Theater in Nashville, Charlie Daniels presented a great picture in time with his friends Mac Wiseman, The Whites, Earl, Gary, and Randy Scruggs plus the Del McCoury family. Daniels and Wiseman sat on stools and the others wandered in and out during the show. What comes across is a real reverent presentation in black and white with great acoustic, natural sounding music, most instruments are miked. Preachin', Prayin', Singin' is produced by longtime friend, David Corlew. Another thing, this was recorded a week after Daniels got back from Iraq with his band, where the CD/DVD Live In Iraq was recorded. It is a great CD of Daniels still rockin'. I could close my eyes and he and his current band sound just like the seventies version. Sorry for the digression, but it's my typewriter. During this presentation, he talks about his Iraq experience which was a real good DVD. He tells what the soldiers wanted him to tell the American people when he got back. By the way, if you don't have "Live In Iraq", just get it too, especially if you love the CDB. After talking about Iraq, he recites the 23rd psalm. Then he picks up a guitar, after he had already sung four gospel songs, and he plays while Mac sings "What Would You Give In Exchange For Your Soul." With all of these great singers and players, this is just good stuff. The whole band is playing by the time the song is over. He now enters into "The Old Crossroads" on guitar, playing a nylon stringed Chet Atkins Gibson. This sounds so amazing. Then he takes a short break and talks to Earl Scruggs. They did a lot together when he first got to town. On the stage , they are joined by Randy and Gary Scruggs. They play "The Salty Dog Blues", Randy plays some great guitar. Then Gary takes off on his mandolin, next Daniels starts fiddling away and they lead up to the last break by Earl on Banjo. A classier crew of musicians, you'll never find. Wiseman is back onstage with Earl on banjo, Jason Carter on Bass, The Scruggs boys. They do "Keep On The Sunny Side" which comes off real good and gives you that Mountain sound. Everyone comes back on stage with Del McCoury and they do an old time version of "Uncle Pen" by Bill Monroe. Daniels is just having a ball, like he is running a three ring circus of the best players and singers in town... and oh yeah, he is! There is something about the personae of Charlie Daniels, when you are in his presence, you just get this feeling like something special is happening and it is. I admit, when I requested to review this album, I asked if he'd autograph it for me and he did. Years ago, I thought I'd caught his e-mail address in a bunch of copied addresses in an e-mail I got, so I sent him him an e-mail, Daniels didn't know me from squat and yet he graciously answered it. I'm officially dgressing again, the first time I saw the CDB was in 1976, opening up for the Marshall Tucker Band, (another one of my faves.) He blew me away and I saw him many more times over the years. McCoury does a song with the Band called "1952 Vincent Black Lightning", a real upbeat bluegrass song. They finish with "I'll Fly Away" which really kicks, an instrumental version. Randy Scruggs steals the pickin' on this song with his solo, man that guy can pick. Anyway, I think you need this one.